Hawaii's Local Secret Is Out! Maui Babe is currently the top selling sun care line in all of Hawaii! 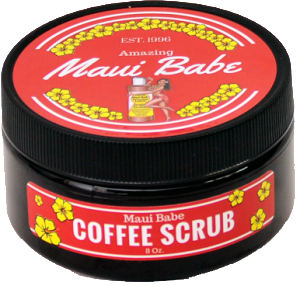 Maui Babe was established in 1996, and already has created a "cult like following". 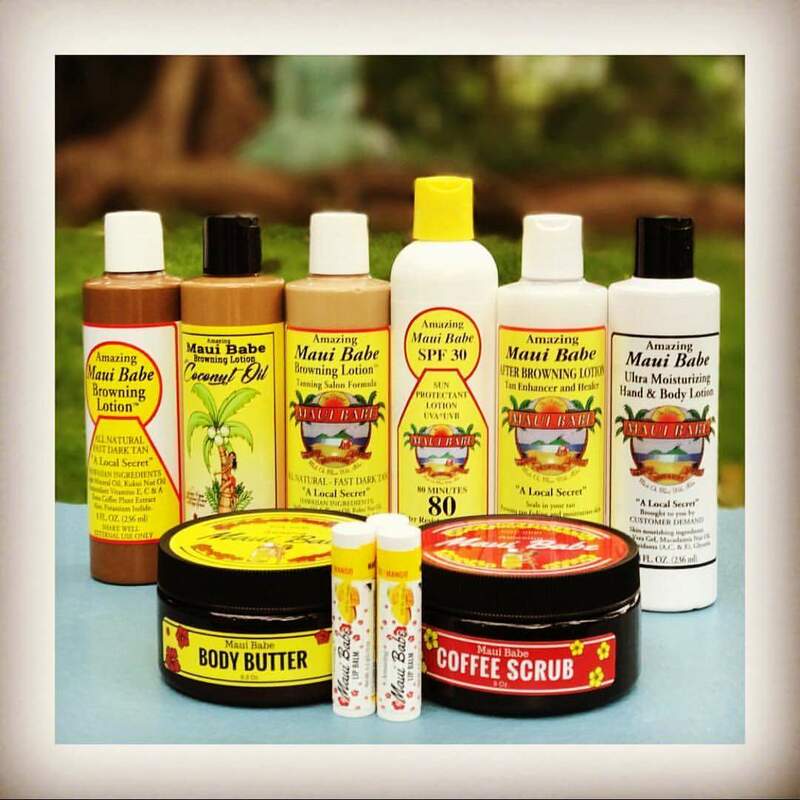 Maui Babe is the unique ALL NATURAL sun care line that has captivated millions of tourists & locals on the islands of Hawaii, including some of Hollywood's elite. 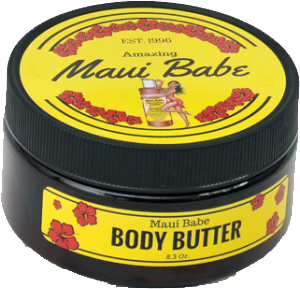 Maui Babe is now available in every state and even Canada! Maui Babe is currently the top selling sun care line in all of the Hawaii area! Maui Babe was established in 1996 and already has created a "cult-like following". We are a niche item in the sun care industry that has buyers from large & small chains flocking to the unique product that increases sun care sales, without displacing their core lines. The "Amazing Browning Lotion" has created a niche for all sun tan enthusiasts with our all natural ingredients including; Kona Coffee extract which gives our product a unique smell & feel, along with our Kukui Nut oil which is a natural skin healer. Maui Babe is now available in ALL major markets and we are partnered with several chain stores and distributors throughout North America and globally." Are we in your stores? We focus on making you happy because your satisfaction is key. We have been listening to our customers and have developed our new line of products based on your needs and wants when it comes to all natural skin care products. Enjoy misting your skin while tanning for an instant boost of all-natural hydration or simply when you want to feel and smell like the Maui Babe you are! A great addition to tanning and skincare routines! After drying, follow up with our Body Butter to lock in the moisture! Always wear Maui Babe SPF 30 with our Browning Lotion when planning extended "play time" in the sun. Our Browning Lotion is for tanning purposes only, and does not include UVA or UVB protection. Maui Babe SPF 30 provides UVA & UVB protection up to 4 hours in the sun before re-applying. Our most popular and unique product provides ALL NATURAL Hawaiian Ingredients to ensure you receive a deep, dark long lasting tan. Our ingredients including; Kukui Nut Oil and Aloe Vera ensures that the lotion absorbs into the skin for a deep tan, and we use very little mineral oil as to not burn the top layer of skin. We also use Kona Coffee extract in our Browning Lotion to provide our distinct fragrance and adding a small fragment of caffeine to the skin, which according to a Rutgers University study, MAY help prevent skin cancer! Our unique After Sun lotion, Maui Babe After Browning Lotion, provides the skin with the necessary moisturizing that it needs all year around. 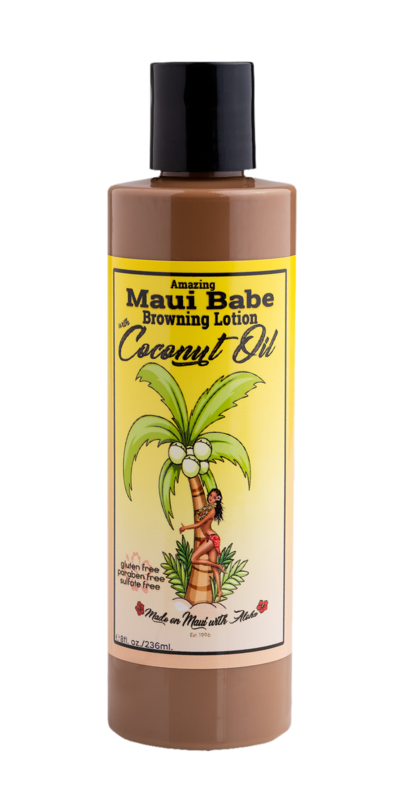 We recommend using Maui Babe After Browning Lotion every day of the year to ensure that the skin receives the vitamins and minerals it needs to stay healthy, smooth and soft. Our ALL NATURAL Hawaiian Ingredients in our After Browning Lotion include; Kukui Nut Oil, Macadamia Nut Oil and Aloe Vera which are all proven ingredients and "old Hawaiian" traditional ingredients to ensure the skin is healthy while keeping your tan! We recommend wearing SPF 30 with UVA & UVB protection every day of the year when in the sun. Our SPF 30 Lotion provides protection from both of the major sun rays which cause skin damage and possible skin cancer. Our SPF 30 lotion also includes a MAUI FRAGRANCE for the most discerning of pallet. Copyright © Maui Babe. All rights reserved.